Almond had helped Amul launch its first mocktail Irish Drink. 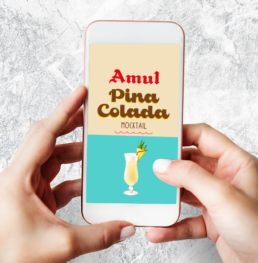 Continuing with its drive to bring the international taste to the Indian youth, Amul intended to launch yet another mocktail – this time Pina Colada! The Piña Colada is a sweet cocktail made with rum, coconut cream or coconut milk, and pineapple juice, usually served either blended or shaken with ice. What could be more luscious, mellower and more fragrant? 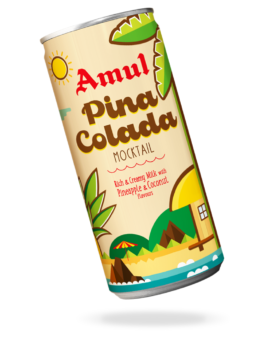 This would be first of its kind ready-to-drink packaged mocktail of Pina Colada in India. Our target would be the evolving youth, aged between 15-20, from urban-semi urban areas. Their drink is their style statement. They might have experienced the original Pina Colada drink in cafés earlier, but their pocket money restricts frequent consumption. That’s where Amul Pina Colada mocktail will come as a respite. The modern-day beach cocktail has its origin in Puerto Rico and hence in 1978, it became the official drink of Puerto Rico. There are no prizes for guessing that we went down understanding the Puerto Rican culture and art to be captured well in the Design Language of the Brand. Since Pina Colada is a drink of white rum, pineapple juice and coconut milk, it has a characteristic colour. The same was captured in the background of the pack, giving it the feel of the original drink. Since this was a flavoured drink we couldn’t have depicted actual ingredients. That was a big challenge! We smartly integrated coconut trees and pineapple leaves in the foliage of the beach design in a way that they don’t pose as ingredient-shots yet communicate the expected taste to the target audience, who may be unaware of the flavours. The perfect blend of flavours – tanginess and sweetness of pineapple and coconut cream, was highlighted on the pack. Overall the Packaging Design captured the experience of consuming a premium mocktail in a convenient packaging. We believe that the Packaging makes you take a mind-trip to Puerto Rico to enjoy the warm sandy beaches and cool breezes. Get inspired by the cocktail’s roots by immersing yourselves in the culture. Cheers!